Hispanics consumer confidence is strong going into 2018. The Hispanic Consumer Sentiment Index (HCSI) finds the Hispanics consumer confidence in the US is holding steady with a score of 93.5, which is a slight uptick from last quarter’s score of 92, but down from 94.8 in the second quarter of 2017. Overall the HCSI is up 3.6 points from the first quarter’s score of 89.9. The HCSI is down 2.4 points compared to the overall population score of 95.9 as published by the University of Michigan for December. Overall the majority Hispanics are optimistic about their financial situation going into 2018. Throughout 2017, Hispanics consistently expressed to be financially better off than a year ago with a range of 68% to 65% among the four quarters. In addition, the majority of Hispanics with a little more volatility over time stated to be optimistic of their financial situation in the year ahead (60% in Q1, 78% in Q2, 74% in Q3 and 71% in Q4). Hispanics leave 2017 as they entered it in regard to how they see business conditions for the next year with 57% expecting business conditions to be good and 43% think things will worsen. This indicator had little variability over the year. In addition, there has been an increase in optimism among Hispanics regarding the economic outlook of the country in the next five years from 45% in the first quarter to 52% in the last quarter of 2017. It appears the Holidays may have added to what was a declining debt problem among Hispanics. In the fourth quarter, 30% of Hispanics reported debt as a major problem versus 40% who said it was a minor problem. Last quarter 24% of Hispanics reported debt as a major problem and 43% reported it as a minor problem. Pocket book issues like the price of gas at the pump might be fueling Hispanic confidence. 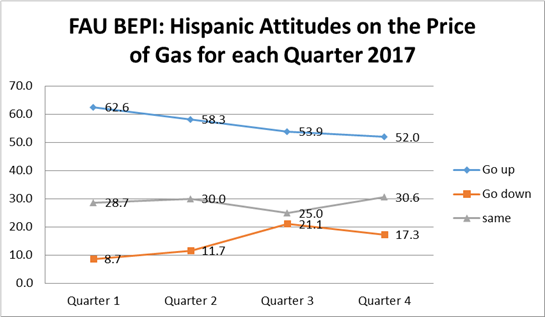 Over the course of 2017, Hispanics expected gas prices not to increase throughout the year which started with 63% expecting prices to go up and ending in Q4 at 52% who expect the price of gas to go up. Regarding President Trump’s performance, 33% of Hispanics approved of the Presidents work with 67% disapproving. This is a slight uptick from Q3 that had a 31% to 69% difference in approval. The last three quarter Presidential approval mirrored closely exit polls that had 28% of Hispanics voting from Trump. The survey is based on a panel sample of Hispanic adults, 18 years of age and older. The survey was administered using both landlines via IVR data collection (23%) and online data collection (77%) using Survey Sampling International SSI. There were 840 respondents sampled between October 1 and December 31, 2017 and a credibility interval, a measure of accuracy, of 3.9 percentage points. Responses for the entire sample were weighted to reflect the national distribution of the Hispanic population by region, education, gender, income and age according to latest American Community Survey data. In the third quarter Hispanics seem sour on the direction of the economy with 23% saying things were getting better and 29% saying things were getting worse while 48% say it is not changing at all. There is an increase of the number of respondents that think things are getting worse in the economy over time. In the first quarter only 16% of the respondents thought that things are getting worse, while in the second quarter that number increased to 22% percent and lastly in the third quarter it reached to 29%. However, Hispanics are optimistic about their personal finances compared to a year ago and of their financial situation in the future. Overall, 65% of Hispanics said they are better off than they were a year ago and 74% said they will be better off over the next year. These numbers are similar to the ones of the second quarter but higher than the ones from the first quarter. Looking closer at Hispanic financial fortune by age, 72% of Hispanics 18-34 years old reported doing better financially than they were a year ago while 61% of those 35-54 and only 58% of those over 55 years old reported doing better financially than a year ago. Similarly 84% of those 18-34 years old and 72% of those 35-54 are optimistic of their future financial situation expected their financial position while those over 55 were significantly less optimistic with 56% expecting to do better financially in the year ahead. Hispanics don’t feel as strong as they did in the previous quarter when it comes to buy big ticket items for their homes and automobiles. Overall, 61% of Hispanics thought it was a good time for buying a big ticket item for their home (down 3 points from previous quarter) and to buy a car at 53% (down 6 points). However, perhaps in response to the expectations of high interest rates in the future (50% of respondents expecting interest rates to borrow to go up), 58% of Hispanics said that now is a good time to buy a house (up 7 points from the previous quarter). 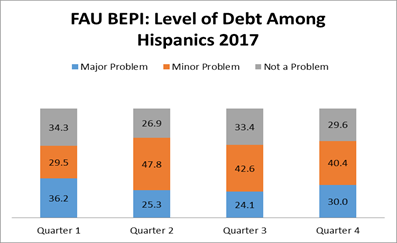 The perceptions of debt as a major problem among Hispanics continues to decline with only 24% reported debt as a major problem in the third quarter, down 12 points from the first quarter; and 43% reported it a minor problem (down 5 points from the second quarter). There was an increase in respondents (33%) indicating that debt was not a problem, up 6 points from last quarter. Overall, 66% of Hispanics think that the cost of living has increased, up 10 points from last quarter. In addition, Hispanics continue to expect the price of gas to go up at 54% while 21% think it will go down. Hispanics approval rating of President Trump continues to drop. This quarter it dropped to 31%, down 2 points from last quarter which was 33% and down 9 points from the first quarter. The poll is based on a panel sample of Hispanic adults, 18 years of age and older. The survey was administered using both landlines via IVR data collection (44%) and online data collection (56%) using Survey Sampling International SSI. There were 1,000 respondents sampled between July 1 and September 30, 2017 and a credibility interval, a measure of accuracy, of 3.5 percentage points. Responses for the entire sample were weighted to reflect the national distribution of the Hispanic population by region, education, gender, income and age according to latest American Community Survey data. 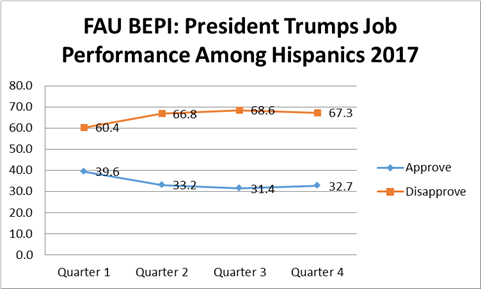 A new FAU BEPI quarterly Hispanic Consumer Sentiment Index finds the Hispanic population in the US improving to a score of 94.8, up about 5 points from last quarter’s score of 89.9, and still down about 5 points from the end of December (99.6). The Hispanics Index is about the same as the general population score of 95.1 as published by the University of Michigan for June. Increased optimism on their personal finances for the upcoming year and their optimism of the economic outlook of the county in the next five years can account for the bounce back. Seventy-eight percent (78%) said they will be financially better off over the next year compared to 60% in the previous quarter. When asked about the economic outlook of the country in the next five years, 51% said they expect good times, up 8 percentage points from the previous quarter. Similar to last quarter 67% of Hispanics say they are better off financially today than they were a year ago and 54% Hispanics continue to see the business conditions good for the next year. Hispanics find it a good time for buying a big item for their home at 64%, to buy a car at 59% and 51% said it was a good time to buy a house. An explanation for Hispanics increase spending could be that Hispanics debt problems have shifted from a major problem to a minor problem. Twenty-five percent (25%) reported debt as a major problem, a drop of 11 points from last quarter; 48% report debt as a minor problem, an increase of 18 points. Twenty-seven percent (27%) said debt was not a problem at all. When it comes to their current cost of living, Hispanics now see the cost of living going down for 21% of them, compared to the 6% last quarter. However, 56% said it has gone up and that is consistent with last quarter. Hispanics continue to expect the price of gas to go up at 58% while 12% think it will go down and they also still expect interest rates to go up at 52% while 18% said they think they will go down. Thirty-percent (30%) expect both gas prices and interest rates to stay the same. Hispanics approval rating of President Trump this quarter dropped to 33% from last quarter which was 39%. The poll is based on a panel sample of Hispanic adults, 18 years of age and older. The survey was administered using both landlines via IVR data collection (14%) and online data collection (86%) using Survey Sampling International SSI. There were 1,000 respondents sampled between April 1 and June 30, 2017 and a credibility interval, a measure of accuracy, of 3.5 percentage points. Responses for the entire sample were weighted to reflect the national distribution of the Hispanic population by region, education, gender, income and age according to latest American Community Survey data. The polling results and full cross-tabulations can be viewed on the FAU website. 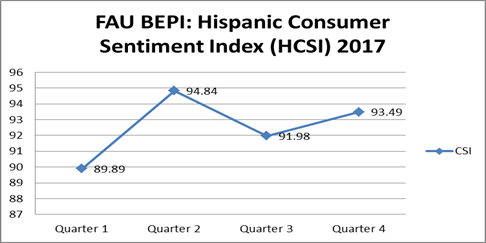 A new quarterly Hispanic Consumer Sentiment Index put out by the Business and Economics Polling Initiative scores the Hispanic population at 89.9, which is down about 10 points from the end of December (99.6) and down 7 points when compared to the general population score of 96.9 as published by the University of Michigan. Driving this weakness in Hispanic consumer sentiment was due to pessimistic views that the country as a whole will face bad time financially over the next five years. When asked about the country on the whole for the next five years, 57% said they expect bad times financially. Interestingly, Hispanics see Business conditions as good for the next year 57% to 43%. Overall 68% of Hispanics say they are better off financially than they were 1 year ago and 60% say they will be better off over the next year as well. The majority of Hispanics don’t see the economy changing much with 54% saying it will stay the same and 30% say it is getting better while 16% say it is getting worse. Hispanics also think it is a good time for buying a big item for their home at 69% and think it is a good time to buy a car at 54% but 46% said it was a good time to buy a house. Debt is a major problem for 36% of Hispanics and a minor problem for an additional 30%. Thirty-four percent (34%) said debt was not a problem at all. When it comes to their current cost of living 57% said it has gone up while 6% said it has gone down, 37% said it has stayed the same. Hispanics are expecting the price of gas to go up at 63% while 9% think it will go down and they also expect interest rates to go up at 52% while 19% said they think they will go down. Twenty-nine percent (29%) expect both gas prices and interest rates to stay the same. The poll is based on a random sample of Hispanic adults, 18 years of age and older. The survey was administered using both landlines via IVR data collection (44%) and online data collection (56%) using Survey Sampling International SSI. There were 500 respondents sampled between January 1 and March 31, 2017 and a credibility interval, a measure of accuracy, of 4.3 percentage points. Responses for the entire sample were weighted to reflect the national distribution of the Hispanic population by region, education, gender, income and age according to latest American Community Survey data.